vCenter Server and ESX/ESXi hosts determine the level of access for the user by reading the permissions that are assigned to the user. The combination of user name, password, and permissions authorizes the user to perform activities on vSphere server objects. Creates new permissions on the specified inventory objects for the provided users and groups in the role. Modifies the properties of the specified permissions. Retrieve the privilege groups and items for the provided servers. Retrieves all roles defined on the provided servers. Creates a new role on the specified servers and applies the provided privileges. Modifies the privileges of the provided roles. By using these cmdlets, you can fully automate the setup of vSphere permissions. The example below shows a sample scenario how to create a custom role and set permissions to a user. First, you can get the privileges of the read-only role. A role is a predefined set of privileges. Privileges define basic individual rights required to perform actions and read properties. To create a new role with custom privileges, use New-VIRole. Note that the Principal parameter supports local users and groups as well as domain users/groups if the vSphere server is joined in AD. These are the simple steps how to create a new role and grant permissions to a user. This entry was posted in vCenter on November 24, 2010 by Yasen Kalchev. Still Not a PowerCLI User? 10 Solid Reasons to Become a Better Professional! 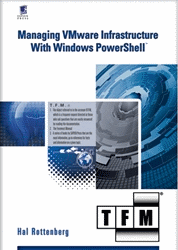 PowerCLI is a cutting edge technology based on the Microsoft PowerShell. Currently PowerShell is recognized as the most advanced shell environment. PowerCLI utilizes all of the PowerShell’s great features in addition to virtualization-related business logic and this makes it the leader of vSphere automation tools. Regardless the size of the environment you manage, it usually takes a lot of time doing repetitive tasks. With PowerCLI you can automate all of the boring processes and focus on the real issues. You don’t need to be a scripting guru to use PowerCLI. Actually, you don’t need a scripting background at all. As one of the users said when he first tried PowerCLI, “Using PowerCLI is more like talking to your virtual environment”. And if you have troubles you can always check our Cmdlet Reference and Administration Guide. A large number of VMware and independent experts are ready to assist you in any situation. Usually, you receive the solution within a couple of minutes after posting your question. Our most advanced users have written a lot of scripts that help them in solving daily issues. You can download them for free and start using them right away. We’ve been developing PowerCLI for 3 years and in that time we’ve made 5 releases. For all these years we’ve been working hard on improving the quality and usability of the product. In all our releases we dedicate a lot of efforts improving the performance. We’ve done a lot of tests on large environments to be sure the product is fast enough for big environments. Most of our features are requested by customers. We believe that a product should follow the customer needs. PowerCLI is free. All you need to do is register and download. Feel free to share thoughts. This entry was posted in Uncategorized on November 1, 2010 by Nedko Nedev.